OK Google! How to use Search for Conversions? Bastian Grimm is the CEO and Director Organic Search at Peak Ace, where he oversees SEO as well as Performance Content Marketing. Bastian who enjoys travelling and meeting new people, had started his career with software deployment. Having more than 15 years of experience in online marketing, Bastian still enjoys all the aspects of technical digital marketing. Today he is a renowned digital expert for large scale international SEO, handling sites with 1 million+ pages in highly competitive industries. On 8th February, at the 3XE Digital Conversion Conference, Bastian Grimm will be telling us about the fast changing Google Search. Naming his discussion topic ‘OK Google, what’s next? Getting control over the unexpected!’, Bastian will cover the most important features of Google search. As Google is getting smarter, he’ll also talk about the impact of new technologies on user behaviour and best ways to marry your efforts with CRO and great User Experience. 3XE Digital: Tell us about your journey in the digital world and one thing that inspired you here. Bastian: I started in software deployment back in the day and ended up online in 1999. I was building websites at the time and at some point, got pretty annoyed about not having any visitors on those. Which was kind of my first touch point with search and actually SEO as well. I worked as an affiliate, moved in-house (amongst other things I was working for a company called Jamba / Jamster which sold mobile phone ringtones at the time; good old times! ), went freelance again and now I’m heading Peak Ace AG. 3XE Digital: What will you be speaking about at 3XE? Bastian: I’ll be touching on how search and user experience are coming more and more together as Google is getting better and better in understanding what users expect and really want. I think to create successful businesses, therefore a long lasting online business is critical. Of course CRO plays a major part in building successful businesses and their monetization strategies, so this will be the core of my talk. I’ll speak on how to integrate these practices and make it most beneficial for all parties involved. 3XE Digital: What are the 3 takeaways that you think delegates will get from your presentation on Google Search? Bastian: The three major areas I’ll be talking about are: Convenience, Instant and Familiarity. I’ll be showing why they are relevant, how to utilize them and what they mean to your day-to-day CRO work. 3XE Digital: Which websites and people influence you on a day to day basis? Bastian: I think it’s really hard and actually would be unfair to just pick one; I think in jobs like ours (in general, with any marketing role) it’s essential to have a trusted network. You need like-minded peers to bounce ideas or to just quickly “sense check” some of the things and thoughts that come along. Conferences such as 3XE Digital are actually a great tool to build and extent exactly this – so for me networking at events is absolutely key. 3XE Digital: How was year 2017 for you? What are your plans for this year? Bastian: Pretty crazy to be honest – but that’s probably true for previous years as well. We almost doubled in staff again, got various awards and will now be adding just another office location in Berlin. So, it’s really going very well and we’re super happy and thankful for our clients and their trust in our work, which allows us to grow and develop further. 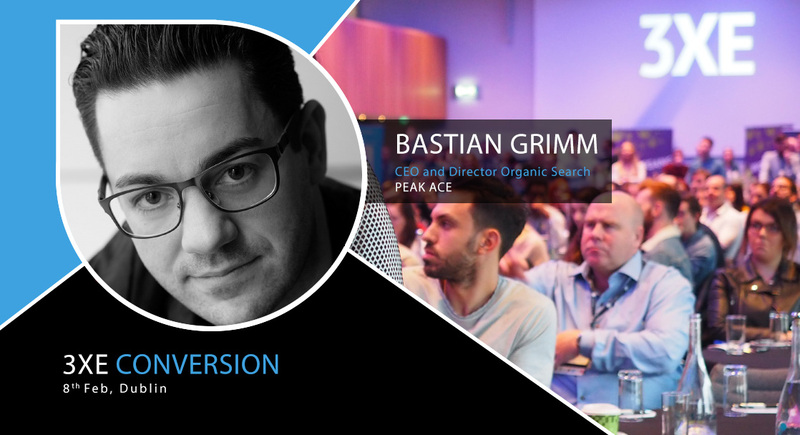 Don’t miss the opportunity of enriching your organic search knowledge, shared by Bastian Grimm at 3XE Digital Conversion Conference on 8th Feb 2018 in Croke Park, Dublin.